Former African champions Esperance of Tunisia are through to the play-offs round of the Confederation Cup. Esperance came back from a 2-1 first leg loss to Tanzania's Azam to win 3-0 and progress 4-2 on aggregate. It was goalless at half-time but in the second period the home side cut loose to end lowly Azam's hopes of an upset. The winners of the last 16 ties will play the losers in the Champions League for a place in the Confederation Cup group phase. Esperance are joined in the next stage by fellow Tunisians, Stade Gabesian. Gabesian had a 3-0 win over Zambia's Zanaco while Sagrada Esperanca of Angola are through against V Club Mokanda of Congo. Uganda's SC Villa managed a 1-0 at home to FUS Rabat of Morocco on Wednesday but the goal was nothing more than a consolation as it finished 7-1 on aggregate. Umar Kasumba scored the only goal of the game from the penalty spot in the 56th minute. Egyptian side Misr Elmaqasah came through a see-saw match against CS Constantine of Algeria to book their place in the play-offs with a 3-1 second-leg win putting them through 3-2 on aggregate. Mohamed Gaber scored twice for Misr Elmaqasah, including what proved to be the winner seven minutes from time to give the African newcomers the victory. Wael Farrag was another two-goal star for an Egyptian club, but his brace in Cairo could not prevent ENPPI being eliminated by Mounana of Gabon after a penalty shootout. Both legs finished 2-0 in favour of the home team and the Libreville outfit won 5-4 on penalties to book a play-offs place for the first time. Another close encounter ended with Kawkab Marrakech of Morocco using home advantage to edge Mouloudia Oran of Algeria 1-0 after a goalless first leg. 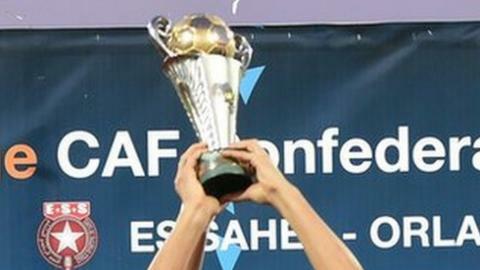 Mohamed Fakih settled the Maghreb derby after 34 minutes in Morocco, calmly converting a penalty. There will be two Moroccan clubs among the 16 in the draw as 2010 Confederation Cup winners FUS Rabat qualified despite a 1-0 loss at Villa of Uganda. The match was also settled by a spot-kick with Umar Kasumba converting a 55th-minute penalty in Kampala. But it was a hollow victory for the East Africans after a 7-0 first leg drubbing in Rabat two weekends ago. Medeama of Ghana reached the play-offs for the second time in three seasons by overcoming Al Ahly Shendy of Sudan 2-0 in Sekondi. After a goalless first leg, Kwame Boahene broke the stalemate 27 minutes into the second leg and Abass Mohammed added a second goal soon after. The eight Confederation Cup last 16 winners will be paired with the Champions League last-16 losers.